Mar 24, 2019; Syracuse, NY, USA; Syracuse attackman Stephen Rehfuss (29) looks to pass during the Orange's 9-8 overtime win at Bragman Stadium at Cicero-North Syracuse High School. Mandatory Photo Credit: Initra Marilyn, The Juice Online. For the third straight week, Syracuse dominated the fourth quarter, and Brendan Curry scored the game winner in overtime as the Orange upset No. 2 Duke on Sunday, 9-8. 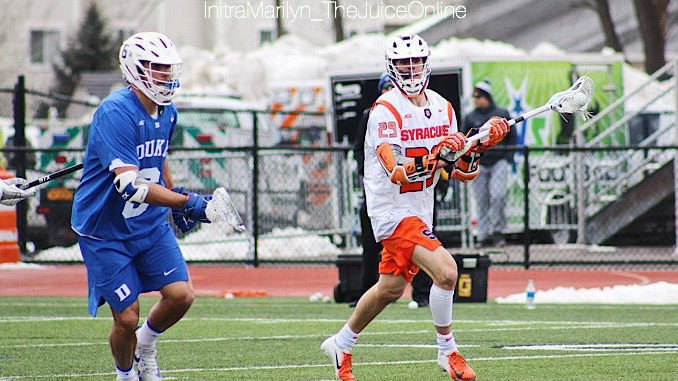 The Orange trailed 6-3 heading into the final quarter, and it appeared Duke had complete control after Brad Smith found Joey Manown for a goal to put the Blue Devils up 7-3 with 9:49 to go. But No. 12 Syracuse scored six of the game’s final seven goals. Stephen Rehfuss tied it at eight with 1:24 remaining, which set up Curry’s heroics on SU’s second possession of overtime. On the game winner, Nate Solomon found Curry behind the net and Curry scored while coming from behind Duke goalie Turner Uppgren’s right side. There was a moment of suspense after the goal, as attention turned toward the officials to see if they’d whistle Curry for being inside the crease. But the officials made no such call, and pandemonium ensued. The late heroics made up for another slow start for the Orange, who fell quickly behind 3-0 early in the first quarter. But the Orange’s man-up unit kept SU close, with five goals on the day. Jamie Trimboli’s man-up goal with 6:22 left in the first pulled the Orange to within 3-2, but Duke would score two unanswered goals in the second quarter to take a 6-2 lead into intermission. Drake Porter led a stout Orange defense with 12 saves, with Jakob Phaup went 8 for 12 at the X. Solomon scored two goals and added two assists. For Duke, Joey Manown scored two goals to go with an assist. SU’s dramatic fourth quarter has become a trend as of late. Two weeks ago, the Orange defeated Johns Hopkins 14-10 after outscoring the Blue Jays 6-1 in the fourth quarter. Last week, the Orange went on an 8-1 run late to topple Rutgers 18-14. Then again, close games have been the norm for Syracuse in the last few years. With the one-goal win, 20 of SU’s last 36 games have been decided by a single goal. The game, moved to Cicero-North Syracuse High School’s Bragman Stadium, was the first time the Orange hosted an outdoor lacrosse game in 30 years. SU had to move because the NCAA Tournament was being hosted at the Carrier Dome. Syracuse now heads on the road to play its first away game of the season, taking on No. 11 Notre Dame in South Bend, Ind. on Saturday at 12 noon. TV: ESPNU.